The primary radio serves as a conduit for priority radio information within the department. It is to be considered and referred to as Central Dispatch. This frequency is to be used to transmit all emergency traffic - both low and high priority. There is a Central Dispatch channel designated for the patrol division. When the status of Central Dispatch is set to strict, radio traffic is to remain priority. Any casual conversation is to be dropped and disallowed. If a member proceeds to start or join in a casual conversation, they shall be warned once; if they continue, they shall be punished accordingly. When the status of Central Dispatch is set to relaxed, members are allowed to engage in casual conversations unless any sort of radio traffic is called out. If low priority traffic is announced, for the duration of the callout, all conversation is to cease until the person calling radio traffic finishes speaking. In the case of a high priority situation(ex: pursuit, shots fired), Central Dispatch is to assume the temporary state of being set to strict until the situation ends. In order to maintain functioning Communications channels when the number of actively patrolling units exceeds five (5) that Communications channel will assume the mode of Strict Radio Traffic. The secondary radio fulfills a primary role as a frequency for non-emergency communications. This radio can also be used to inform other units for pursuits or traffics stops. Examples of proper usage include requesting a patrol partner, going on duty, and going off duty. Casual conversation is to be allowed unless otherwise stated by a supervisor or higher. The interdepartmental radio is used to contact other departments for emergency situations. Use of this radio for non-emergency related matters is strictly prohibited and should be punished accordingly. Cadets are allowed to use this radio with the permission of an officer or, in the case of needing medical assistance, at their own discretion. When responding to department radio calls, the highest available rank on-duty is the only one to reply unless unable to - where the Chain of Command would be followed. The department family or out-of-character chat is to be used entirely for casual discussion and should not contain any in-character requests or transmissions. Using this frequency as a tool to metagame is highly punishable and will result in serious disciplinary action. By accepting the department badge, a member has formally agreed to follow all department policies, enforce all department standards, and uphold all department morals until he/she officially retires from the San Andreas Police Department. With the responsibility of receiving the department badge, the new department member will be required to act professional at all times while wearing it and to act righteously while in its presence. The badge shall act as the ultimate source of accountability for all members of the San Andreas Police Department who present it. Upon joining the department, every member will receive a badge to identify his/her self as an employee of the San Andreas Police Department. Every department member is required to have a badge and have it present while on duty. Before achieving the rank of officer - if being promoted from cadet - department members are expected to be assigned a badge number. Badge numbers are unique, three digit callsigns where each can only be assigned to one person at a time. 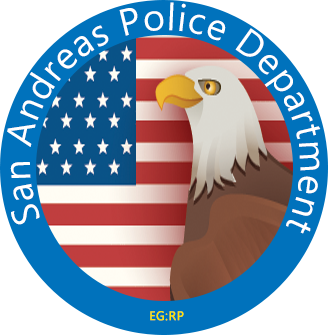 Employees of the San Andreas Police Department are authorized to refer to themselves and to others by their badge numbers. If a member has not yet been assigned a badge number, they must request one using the appropriate process ((administrative requests)) and temporarily replace the digits in their callsign with the letter x. (ex: PXXX). Once a department member has been issued a badge number, he/she is unable to request a new one unless told to by a member of High Command - where the member will receive another randomly selected, available badge number. High Command members are authorized to change their own badge numbers at any time. The Commissioner, and the department’s Technology Department Manager are the only ones authorized to set another department member’s badge to a specific number. Furthermore, the Commissioner is the only person allowed to authorize the change of a person’s badge number to part of a non-standard range(100’s place).